For other uses, see Cork (disambiguation). Cork is an impermeable buoyant material, the phellem layer of bark tissue that is harvested for commercial use primarily from Quercus suber (the cork oak), which is endemic to southwest Europe and northwest Africa. Cork is composed of suberin, a hydrophobic substance. Because of its impermeable, buoyant, elastic, and fire retardant properties, it is used in a variety of products, the most common of which is wine stoppers. 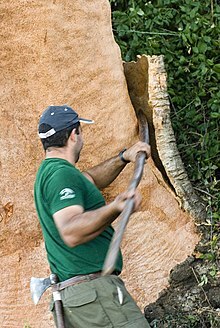 The montado landscape of Portugal produces approximately half of cork harvested annually worldwide, with Corticeira Amorim being the leading company in the industry. Cork was examined microscopically by Robert Hooke, which led to his discovery and naming of the cell. Carbon footprint studies conducted by Corticeira Amorim, Oeneo Bouchage of France and the Cork Supply Group of Portugal concluded that cork is the most environmentally friendly wine stopper in comparison to other alternatives. The Corticeira Amorim’s study, in particular ("Analysis of the life cycle of Cork, Aluminum and Plastic Wine Closures"), was developed by PricewaterhouseCoopers, according to ISO 14040. Results concluded that, concerning the emission of greenhouse gases, each plastic stopper released 10 times more CO2, whilst an aluminium screw cap releases 26 times more CO2 than does a cork stopper. Cork is extracted only from early May to late August, when the cork can be separated from the tree without causing permanent damage. When the tree reaches 25–30 years of age and about 24 in (60 cm) in circumference, the cork can be removed for the first time. However, this first harvest almost always produces poor quality or "virgin" cork (Portuguese cortiça virgem; Spanish corcho bornizo or corcho virgen). Bark from initial harvests can be used to make flooring, shoes, insulation and other industrial products. Subsequent extractions usually occur at intervals of 9 years, though it can take up to 13 for the cork to reach an acceptable size. If the product is of high quality it is known as "gentle" cork (Portuguese cortiça amadia, but also cortiça secundeira only if it is the second time; Spanish corcho segundero, also restricted to the "second time"), and, ideally, is used to make stoppers for wine and champagne bottles. The workers who specialize in removing the cork are known as extractors. An extractor uses a very sharp axe to make two types of cuts on the tree: one horizontal cut around the plant, called a crown or necklace, at a height of about 2–3 times the circumference of the tree, and several vertical cuts called rulers or openings. This is the most delicate phase of the work because, even though cutting the cork requires significant force, the extractor must not damage the underlying phellogen or the tree will be harmed. These freed portions of the cork are called planks. The planks are usually carried off by hand since cork forests are rarely accessible to vehicles. The cork is stacked in piles in the forest or in yards at a factory and traditionally left to dry, after which it can be loaded onto a truck and shipped to a processor. As late as the mid-17th century, French vintners did not use cork stoppers, using instead oil-soaked rags stuffed into the necks of bottles. Wine corks can be made of either a single piece of cork, or composed of particles, as in champagne corks; corks made of granular particles are called "agglomerated corks". Natural cork closures are used for about 80% of the 20 billion bottles of wine produced each year. After a decline in use as wine-stoppers due to the increase in the use of synthetic alternatives, cork wine-stoppers are making a comeback and currently represent approximately 60% of wine-stoppers today[when?]. Because of the cellular structure of cork, it is easily compressed upon insertion into a bottle and will expand to form a tight seal. The interior diameter of the neck of glass bottles tends to be inconsistent, making this ability to seal through variable contraction and expansion an important attribute. 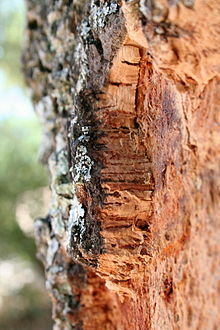 However, unavoidable natural flaws, channels, and cracks in the bark make the cork itself highly inconsistent. In a 2005 closure study, 45% of corks showed gas leakage during pressure testing both from the sides of the cork as well as through the cork body itself. Since the mid-1990s, a number of wine brands have switched to alternative wine closures such as plastic stoppers, screw caps, or other closures. During 1972 more than half of the Australian bottled wine went bad due to corking. A great deal of anger and suspicion was directed at Portuguese and Spanish cork suppliers who were suspected of deliberately supplying bad cork to non-EEC wine makers to help prevent cheap imports. Cheaper wine makers developed the aluminium "Stelvin" cap with a polypropylene stopper wad. More expensive wines and carbonated varieties continued to use cork, although much closer attention was paid to the quality. Even so, some high premium makers prefer the Stelvin as it is a guarantee that the wine will be good even after many decades of ageing. Some consumers may have conceptions about screw caps being representative of lower quality wines, due to their cheaper price; however, in Australia, for example, much of the non-sparkling wine production now uses these Stelvin caps as a cork alternative, although some have recently switched back to cork citing issues using screw caps. These alternatives to cork have both advantages and disadvantages. For example, screwtops are generally considered to offer a trichloroanisole (TCA) free seal, but they also reduce the oxygen transfer rate between the bottle and the atmosphere to almost zero, which can lead to a reduction in the quality of the wine. TCA is the main documented cause of cork taint in wine. However, some in the wine industry say natural cork stoppers are important because they allow oxygen to interact with wine for proper aging, and are best suited for wines purchased with the intent to age. Stoppers which resemble natural cork very closely can be made by isolating the suberin component of the cork from the undesirable lignin, mixing it with the same substance used for contact lenses and an adhesive, and molding it into a standardized product, free of TCA or other undesirable substances. 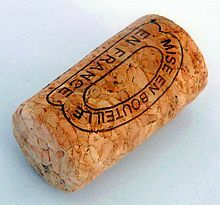 Composite corks with real cork veneers are used in cheaper wines. The study "Analysis of the life cycle of Cork, Aluminum and Plastic Wine Closures," conducted by PricewaterhouseCoopers and commissioned by a major cork manufacturer, Amorim, concluded that cork is the most environmentally responsible stopper, in a one-year life cycle analysis comparison with plastic stoppers and aluminum screw caps. 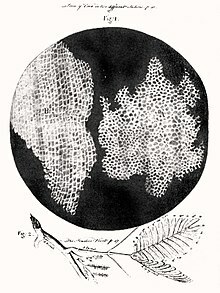 The famous early (1665) micrograph of cork, drawn by Robert Hooke, and described in Micrographia, book written by him. Fig. A (Right) is TS and Fig. B (Left) is LS of cork. Cork is used in musical instruments, particularly woodwind instruments, where it is used to fasten together segments of the instrument, making the seams airtight. Low quality conducting baton handles are also often made out of cork. 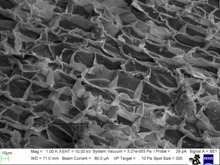 It is also used in shoes, especially those using welt construction to improve climate control and comfort. Because it is impermeable and moisture-resistant, cork is often used as an alternative to leather in handbags, wallets and other fashion items. Cork can be used to make bricks for the outer walls of houses, as in Portugal's pavilion at Expo 2000. On November 28, 2007, the Portuguese national postal service CTT issued the world's first postage stamp made of cork. Cork is used as the core of both baseballs and cricket balls. A corked bat is made by replacing the interior of a baseball bat with cork – a practice known as "corking". It was historically a method of cheating at baseball; the efficacy of the practice is now discredited. Cork is often used, in various forms, in spacecraft heat shields and fairings. Cork can be used in the paper pick-up mechanisms in inkjet and laser printers. Cork is used to make later-model pith helmets. 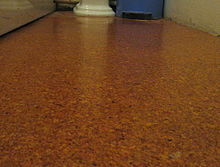 Cork has been used as a core material in sandwich composite construction. Cork can be used as the friction lining material of an automatic transmission clutch, as designed in certain mopeds. Cork can be used instead of wood or aluminium in automotive interiors. Cork can also be used to make watch bands and faces as seen with Sprout Watches. Cork slabs are sometimes used by orchid growers as a natural mounting material. Cork paddles are used by glass blowers to manipulate and shape hot molten glass. Many racing bicycles have their handlebars wrapped in cork-based tape manufactured in a variety of colors. ^ "Robert Hooke". Retrieved 2010-11-03. ^ "Cork Production – Area of cork oak forest". apcor.pt. APCOR. Archived from the original on 2015-03-18. ^ Skidmore, Sarah, USA Today (August 26, 2007). "Stopper pulled on cork debate"
^ McClellan, Keith. "Apples, Corks, and Age". Blanco County News. Archived from the original on 2014-12-27. Retrieved 22 May 2014. 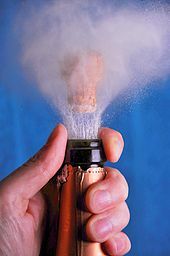 ^ Henley, Paul, BBC.com (September 18, 2008) "Urging vintners to put a cork in it"
^ a b "DRAE". Lema.rae.es. ^ Amadio comes from and is synonym of amavio, "beberage or spell to seduce" (Dicionário Houaiss da Língua Portuguesa), from amar, "to love". ^ "Harvesting Cork Is as Natural as Shearing Sheep". Newsusa.com. ^ Stavroulakis, G.E. (2005). "Auxetic behaviour: Appearance and engineering applications". Physica Status Solidi B. 242 (3): 710–720. Bibcode:2005PSSBR.242..710S. doi:10.1002/pssb.200460388. ^ Karade SR. 2003. An Investigation of Cork Cement Composites. PhD Thesis. BCUC. Brunel University, UK. ^ Prlewe, J. Wine From Grape to Glass. New York: Abbeville Press, 1999, p. 110. ^ Gibson, Richard, Scorpex Wine Services (2005). "variability in permeability of corks and closures" (PDF). Archived from the original (PDF) on May 12, 2013. ^ "Rusden Wines abandons screwcap for cork". Harpers.co.uk. Harpers Wine & Spirit Trade News. Retrieved 22 September 2018. ^ "Cork or screw cap – which is best for your wine?". Corklink.com. ^ Konohovs, Konohovs (16 June 2014). "The True Cost of a Bottle of Cheap Wine". KALW. Retrieved 8 May 2017. ^ "Evaluation of the environmental impacts of Cork Stoppers versus Aluminium and Plastic Closures: Analysis of the life cycle of Cork, Aluminium and Plastic Wine Closures" (PDF). December 4, 2008. ^ Easton, Sally. "Cork is the most sustainable form of closure, study finds". Decanter. Retrieved 2016-04-03. ^ "Genesis: Search for Origins Spacecraft Subsystems – Sample Return Capsule". JPL NASA. Retrieved 28 February 2018. cork-based material called SLA-561V that was developed by Lockheed Martin for use on the Viking missions to Mars, and have been used on several missions including Genesis, Pathfinder, Stardust and the Mars Exploration Rover missions. ^ "Pith vs. Cork – Not One and the Same". Militarysunhelmets.com. Military Sun Helmets. Henley, Paul, BBC.com (September 18, 2008). "Urging vintners to put a cork in it". Cork - Forest in a Bottle. 2008. Wikimedia Commons has media related to Cork (material). This page was last edited on 16 April 2019, at 14:27 (UTC).